Peptide competition data indicate that this antibody cross-reacts with the PKA nu subunit (64% homologous) and partially with the alpha subunit (82% homologous). Synthetic phosphopeptide derived from a region of human PKA catalytic beta subunit that contains serine 338.
c-AMP-dependent Protein Kinase (PKA) is a serine/threonine kinase that regulates a number of cellular processes including proliferation, ion transport and gene transcription. PKA is composed of conserved catalytic subunits and regulatory subunits that dissociate upon activation by cAMP. The catalytic subunit of PKA contains the activation loop and mediates DNA binding and substrate recognition. The catalytic subunit is assembled and expressed as an active form and is phosphorylated on threonine 197 by PDK 1 in the activation loop and serine 338 in the carboxyl terminus. Phosphorylation of serine 338 plays a key role in stabilizing PKA and activating its substrates, and hence mediating its biological functions. The antibody has been negatively preadsorbed using a non-phosphopeptide corresponding to the site of phosphorylation to remove antibody that is reactive with non-phosphorylated PKA. The final product is generated by affinity chromatography using a PKA-derived peptide that is phosphorylated at serine 338. Our Abpromise guarantee covers the use of ab5816 in the following tested applications. WB 1/1000. Detects a band of approximately 42 kDa. Mediates cAMP-dependent signaling triggered by receptor binding to GPCRs. PKA activation regulates diverse cellular processes such as cell proliferation, the cell cycle, differentiation and regulation of microtubule dynamics, chromatin condensation and decondensation, nuclear envelope disassembly and reassembly, as well as regulation of intracellular transport mechanisms and ion flux. Isoform 1 is most abundant in the brain, with low level expression in kidney. Isoform 2 is predominantly expressed in thymus, spleen and kidney. Isoform 3 and isoform 4 are only expressed in the brain. Belongs to the protein kinase superfamily. AGC Ser/Thr protein kinase family. cAMP subfamily. Asn-3 is partially deaminated to Asp giving rise to 2 major isoelectric variants, called CB and CA respectively. Cytoplasm. Nucleus. Translocates into the nucleus (monomeric catalytic subunit) (By similarity). The inactive holoenzyme is found in the cytoplasm. Peptide Competition: Lysates prepared from 3T3-L1 cells were resolved by SDS-PAGE on a 10% polyacrylamide gel and transferred to PVDF. Membranes were either treated with lambda phosphatase (1) or left untreated (2-5), blocked with a 5% BSA-TBSTbuffer for two hours at room temperature, and incubated with ab5816 antibody for two hours at room temperature in a 3% BSA-TBST buffer, following prior incubation with: no peptide (1, 2), the non-phosphopeptide corresponding to the immunogen (3), a generic phosphoserine-containing peptide (4), or, the phosphopeptide immunogen (5). After washing, membranes were incubated with goat F(ab’)2 anti-rabbit IgG HRP-conjugate and bands were detected using the Pierce SuperSignalTM method. 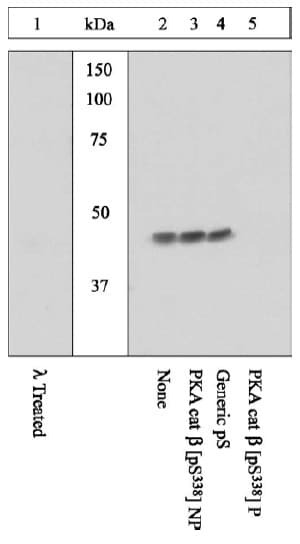 The data show that the peptide corresponding to PKA cat beta [pS338] blocks the antibody signal, thereby verifying the specificity of the antibody. The data also show that phosphatase stripping eliminates the signal, verifying that the antibody is phospho-specific. Publishing research using ab5816? Please let us know so that we can cite the reference in this datasheet. Our customer want to know to dectect PKA protein, is it needed to stimulation to cell or just endogenous level in cell. Thank you for your enquiry. Stimulation is NOT required for the detection of PKA beta (catalytic subunit) (phospho S338) by ab5816. I'm very interested in the various phospho specific antibodies (AB's) for PKA that you offer (codes: ab5818, 5829 &ab5816) . Since it is unclear if these AB's can be used for immunocytochemical procedures (microtome sections of mouse brains), is there a possibility to get smaller samples of these antibodies for test purposes?? Thank you for your enquiry. We do not routinely offer free or trial sized samples for testing purposes. Our policy at Abcam is that if an antibody does not work as specified on the datasheet, we will offer a replacement or reimbursement. Should you decide to test an antibody in an application for which we do not have any information, please let us know how you get on and in return we will forward a GBP10/ USD15/ EUR15 Amazon gift voucher.